This is a sci-fi story told through verse–so I’m unsure if I should categorize it as poetry or science fiction. This work tells the tale of a couple, Mr. and Mrs. Everydream, who have traveled to Earth from another planet. Throughout the many poems, these two learn what it’s like to live all over the USA. They paint the flowing waters of the Hudson River, see the movie production in Hollywood, and spend time exploring the streets of New York. Mrs. Everydream gives birth to a daughter named Taralee and relatives from their home planet are out to steal the child. Mr. and Mrs. Everydream must communicate with their home planet to keep their daughter safe. This story is only 95 pages, so it’s hard to summarize it without giving too much plot away. My synopsis cannot do the intricate plot justice, and I hope Helene Pilibosian can forgive me. That being said, this is such a phenomenal work of literature. I never would have expected myself to pick up a science fiction story told through verse; I haven’t read a poetry book in ages. I’m so glad that I gave this one a try because it’s beautifully written. Pilibosian truly has a way to make the reader think about what she’s describing and really paints a picture for the audience. 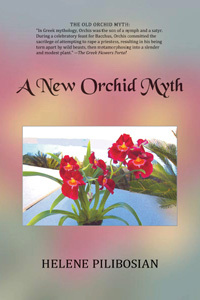 A New Orchid Myth exceeded all of my expectations for such a unique genre and I’d recommend it to all poetry lovers. As I said, it’s very short and easy to read in one sitting. I hope to read more from Helene Pilibosian in the future! A big thank you to her for sending me a physical copy as well!